The adventures of an RV-owning traveler with a running problem. The day that I was most anticipating since we started planning our trip to Alaska was the day we would spend in Juneau because of the awesome excursion I found. 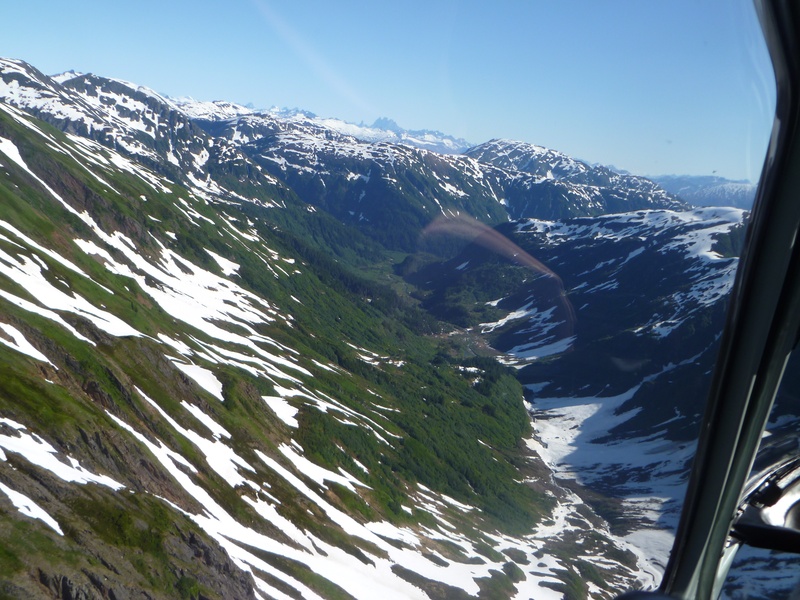 I had an Alaska bucket list in my head and when I saw this excursion, I realized I could knock three things off the list in one fell swoop. 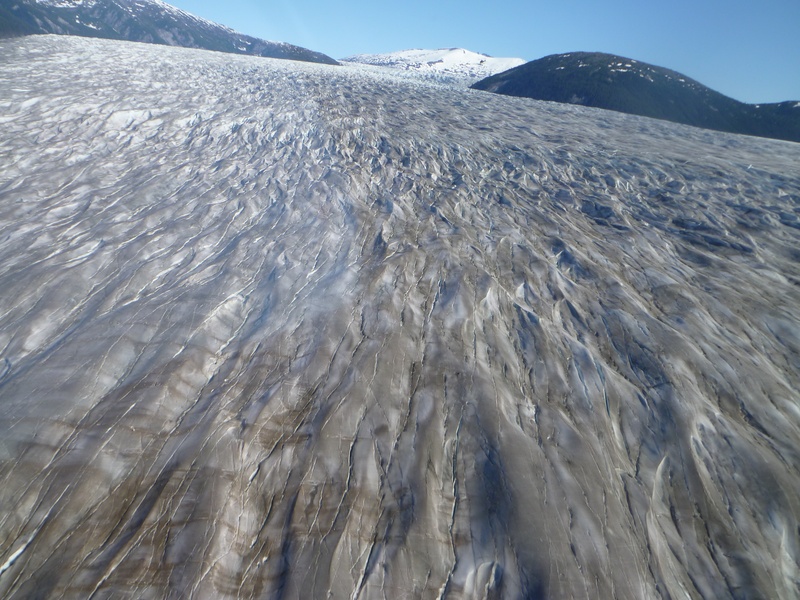 The excursion was a helicopter ride to a glacier, landing on a glacier and dog sledding. 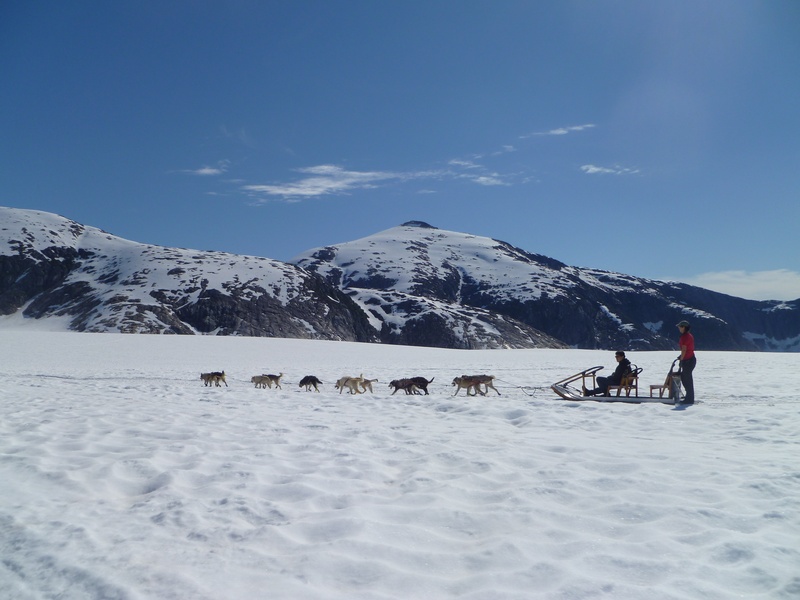 There were several dog sledding excursions at other ports along the way but because it was summertime, most of them didn’t have dogs pulling actual sleds on snow, but wheeled carts on pavement or gravel paths. This is how they train the dogs during the summer months. 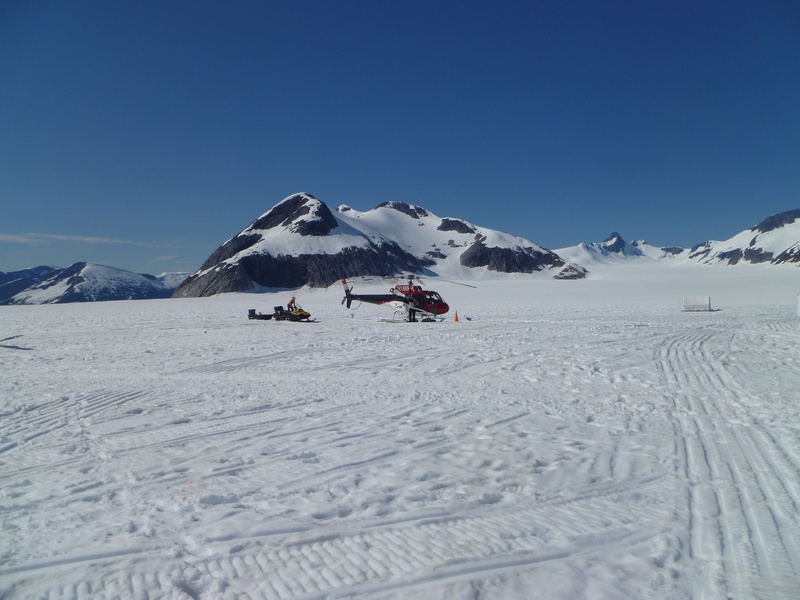 The carts would have been an OK experience, I suppose, but when I saw the excursion with actual sledding — on a glacier (!!) — the alternative didn’t seem nearly as exciting anymore. The price tag for the excursion was pretty steep but I did not find one negative review of the tour company. In fact, almost every one I read said it was the highlight of their entire trip. The whole experience sounded simply amazing. We shared the helicopter with a lady and her teenaged niece which left one open seat so we had a little breathing room. 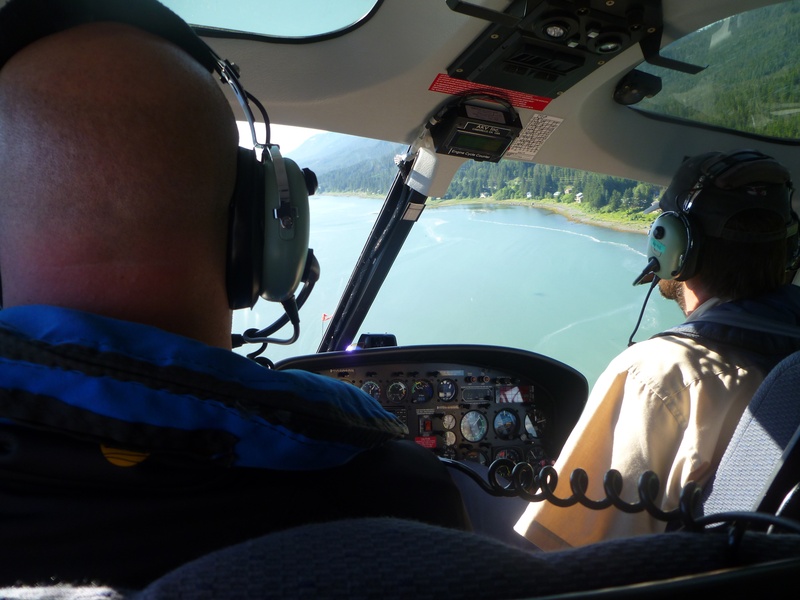 Brian lucked out and got to sit in the co-pilot seat on the way to the glacier. The views were spectacular. 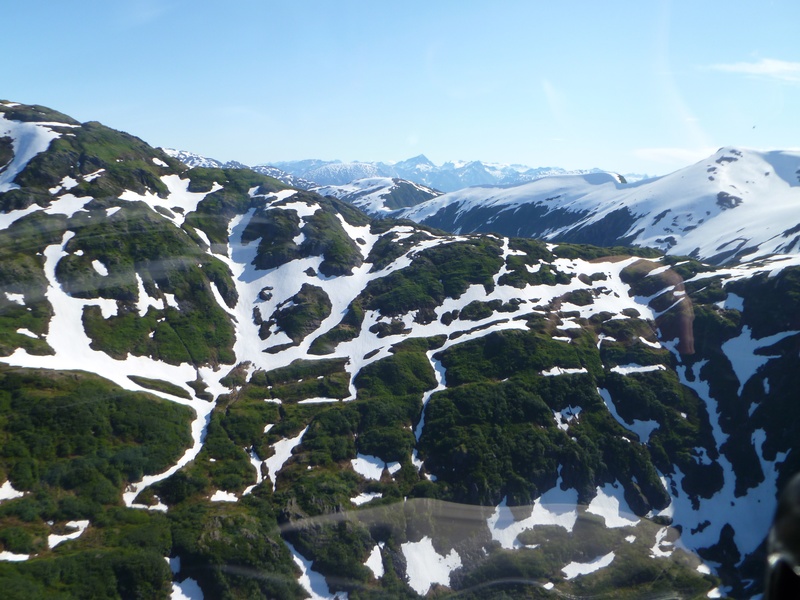 We crossed over a snow-capped mountain range to get to the Juneau Ice Field. 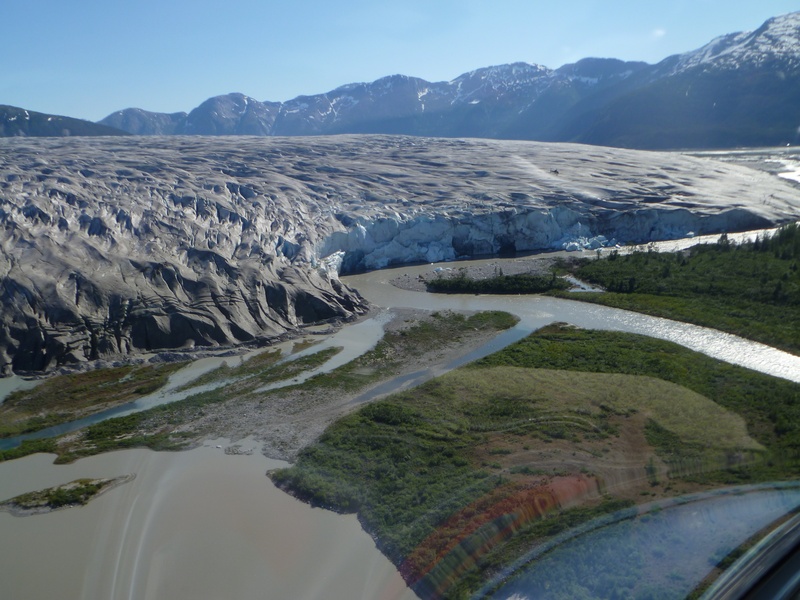 Along the way we flew over a few massive glaciers, including the tail end of the Norris Glacier, the glacier on which the dog mushers camp was located and where we would be landing. 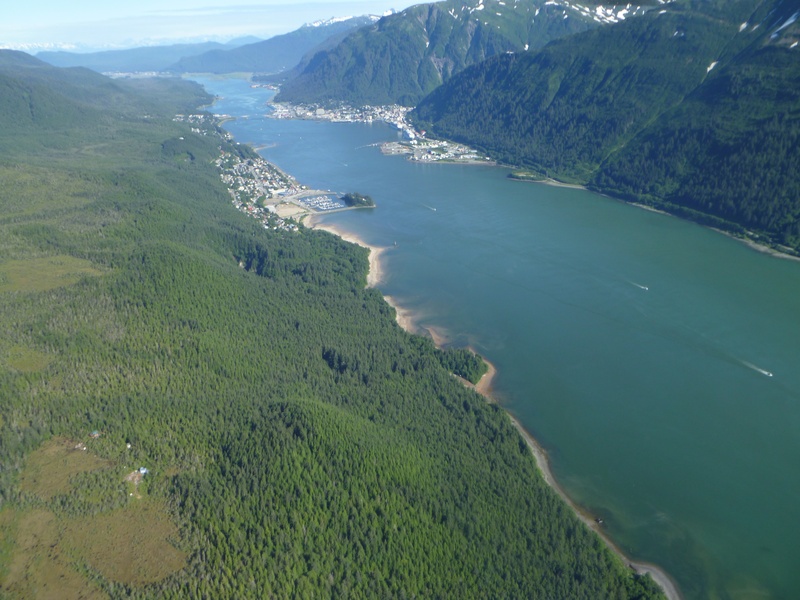 Juneau is on the right, Douglas, Alaska is on the left. 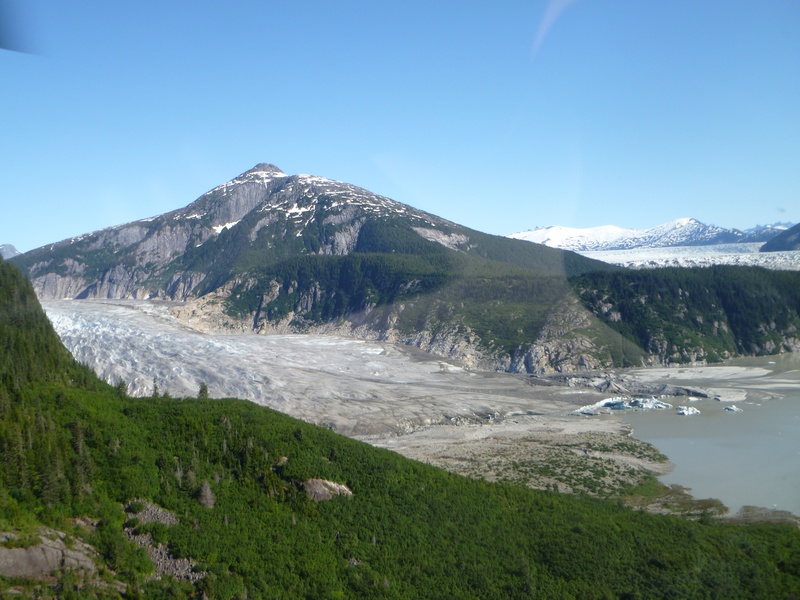 Tail end of the Norris Glacier. There were five helicopters in the fleet that took off at the same time and all flew in formation, landing one at a time on the glacier. It was pretty neat to see. 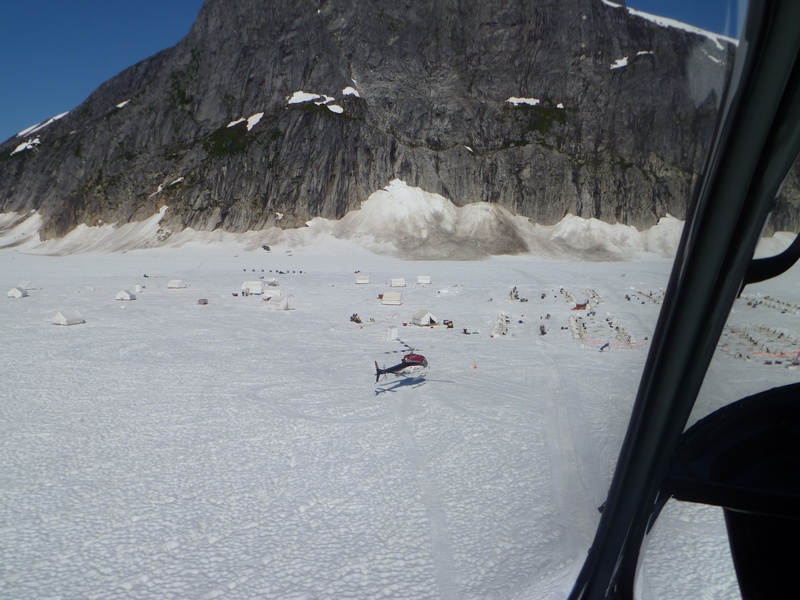 Arriving at the musher’s camp on Norris Glacier. 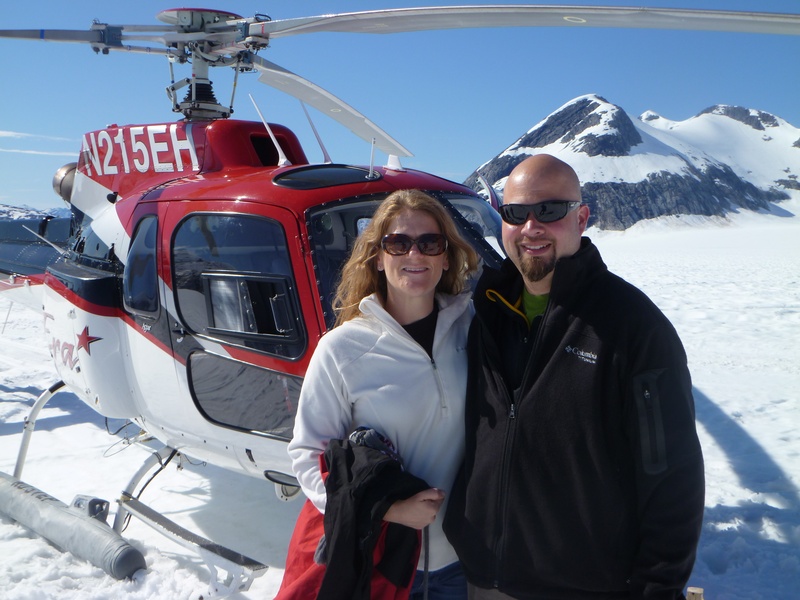 We stepped off the helicopter and were standing on hundreds of feet of ice dating back centuries. Pretty amazing when you think about it. 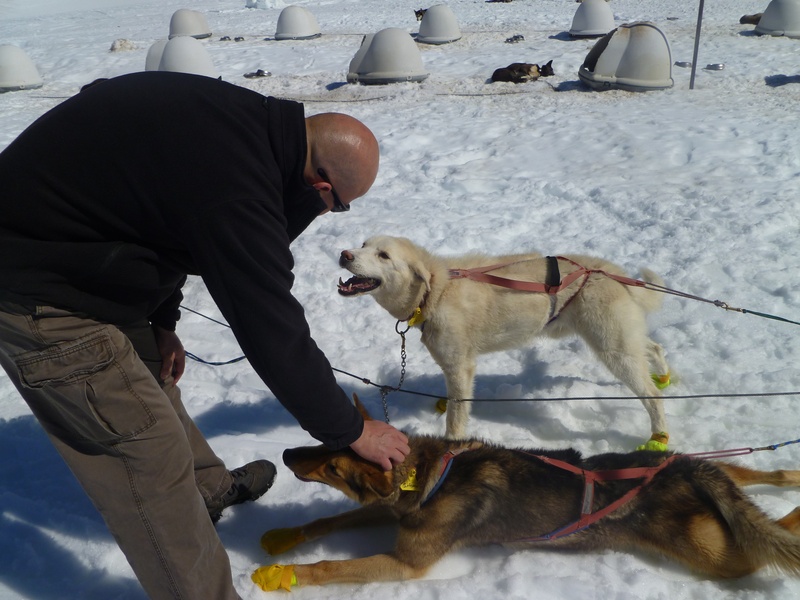 Once there, each helicopter group paired off with a dog musher. 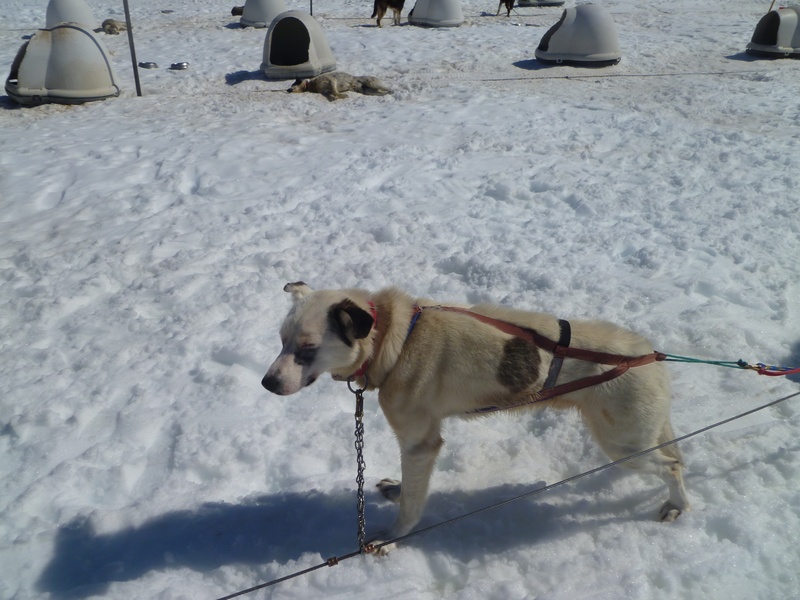 Ours was Dave Dalton who, in February, came in 12th place at the Yukon Quest race. The Yukon Quest is a 1,000-mile race from Whitehorse, Yukon, to Fairbanks. 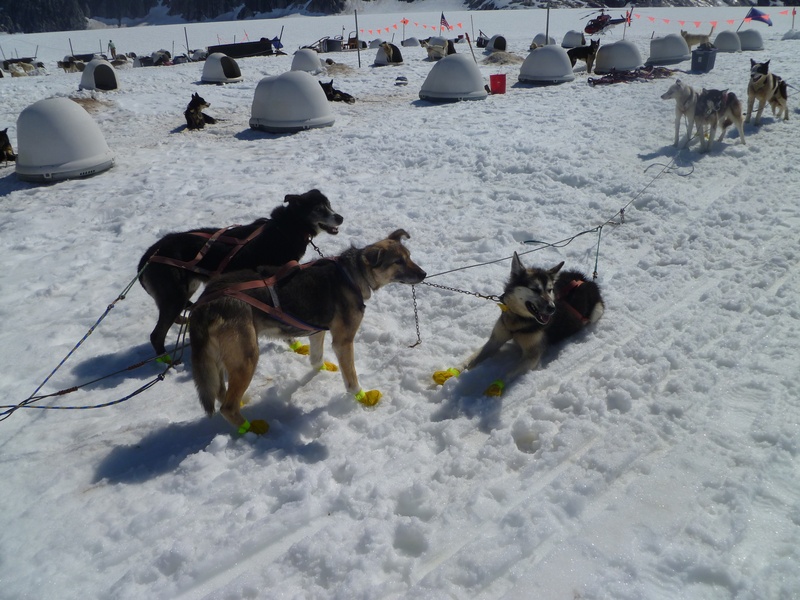 The course is considered to be among the most rugged of all North American dog sledding events. The other thing the race is known for is the amazing athleticism of the dogs who run it and the great care the mushers take of those athletes. Us with Dave Dalton, our expert musher. Dave told us a bit about the training while we were out with him and I was so fascinated, I did a bit more research on my own. Just like humans, the dogs train by building up their mileage, cross-training and eating right. But I don’t know of any humans who have the same level of endurance that these dogs do. Not even ultra-marathon man Dean Karnazes. The Yukon Quest goes anywhere from 10 to 16 days which means the dogs run anywhere from 80 to 100 miles a day, every day for about two weeks. The even more amazing thing is that dogs generally race for 10 years, some up to 12 years. I was also surprised at how little the dogs were. I expected large huskies weighing in at about 75 to 80 pounds but they average only about 40 pounds. Until I saw the dogs in person I was a little skeptical of the claim I have often heard that the dogs absolutely love to run. Once I saw them in action, I realized it’s true. Forget the Tarahumara Indians Christopher McDougall wrote about in his book “Born to Run.” These dogs were truly born to run. 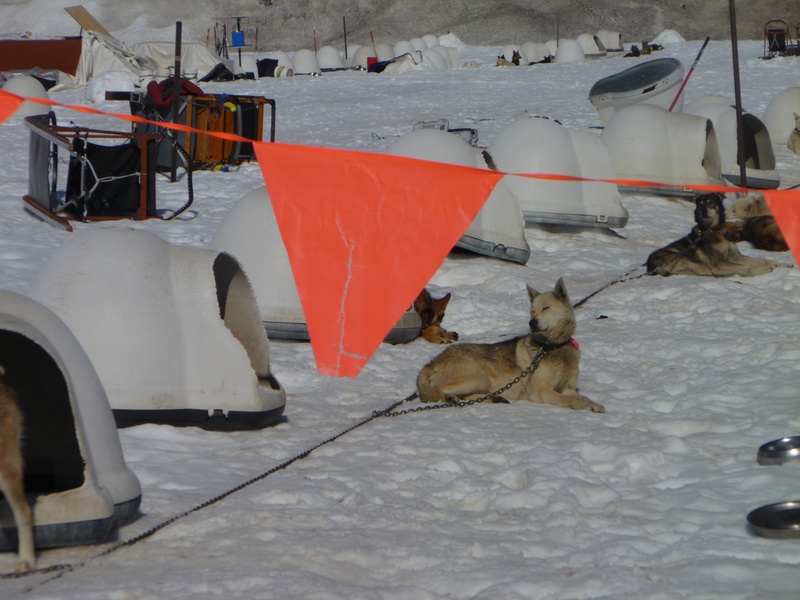 When we would stop to let them rest, they would lay flat on their bellies to cool down for a few short minutes then they would be up, pulling and howling because they were ready to go. The one thing we were told right away is to never step off the brake. If you do, the dogs will take off without you. Even on the brake, it was difficult at times to keep them from pulling the sled out from under your feet. This video kind of shows it. We each got to take a turn in the “driver’s seat.” The whole experience was so memorable and I was left in complete aw of these amazing athletes who also happened to be pretty darn cute. I am a chronic adventurer who loves to see and experience new places. What I really love most is experiencing those places after parking my RV and lacing up my running shoes. 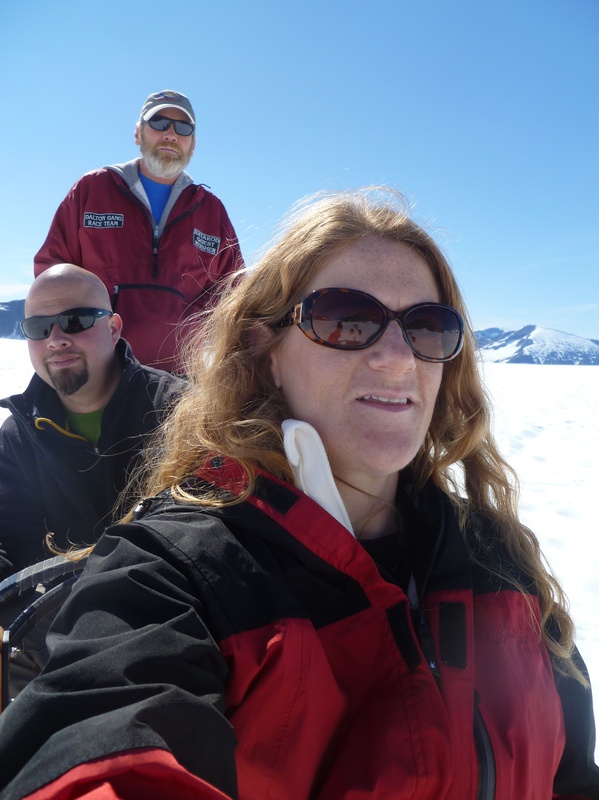 This entry was posted in Alaska, Alaska, bucket list, bucket list, Fitness, health, Running, traveling, Uncategorized and tagged dogsledding, dogsledding in Alaska, dogsledding on a glacier, helicopter ride to Glacier, Juneau, Juneau Ice Field, Norris Glacier. Bookmark the permalink.